Beijing is the Los Angeles of the Far East, at least in terms of smog—that harmful and hazy accumulation of air pollution in the sky. Recently, Beijing has experienced unprecedented smog levels due to the city’s dense population of coal-burning industries, combustion engines and manufacturing plants. The city’s environmental officials have even instructed children and the elderly to stay inside to avoid breathing problems. But, it doesn’t stop there. Excessive smog and pollution is affecting other areas of China as well. Enter Dutch artist and designer DaanRoosegaarde. After being saddened by the smog and lack of visibility in China earlier this year, Roosegaarde began work on a miraculous invention—a ground-level “vacuum cleaner” that literally snatches pollutants out of the air. Thanks to an ingenious system of buried copper coils, which form an electrostatic field that attracts smog particles, the Chinese will actually be able to see the difference as carcinogenic hazes dissipate before their eyes. Once the smog particles have been sucked down to sidewalk-level, they form a dark and sticky tar-like substance. The natural inclination may be to scrap the stuff, but Roosegaarde has other ideas. The artist and designer would prefer to recycle it for the purpose of raising environmental awareness. "We have this idea to make rings out of the tar, like wearable jewelry," he says. "So it can be like a souvenir." This isn’t the first time that Roosegaardeand his teamhave applied elements of fantastical artistry to address the sad reality of urban ecosystems. In their native Netherlands, they designed a new road system (dubbed a “Smart Highway”) that uses glow-in-the-dark street signs and lane demarcations. And, in a project that would have even the likes of Ed Begley, Jr. dancing over the moon, they’ve actually created a “Sustainable Dance Floor,” which collects the energy from gyrating club-hoppers and turns it into electricity. The electrostatic vacuum cleaner was successfully tested at the Technical University of Delft, and Roosegaarde swore it worked on NPR. Now, the group’s Amsterdam-based firm, Studio Roosegaarde, is erecting a small park in Beijing where the copper coils will be buried in the ground. "It's a great radical project," he says. "I can't wait to walk in the public park in Beijing next year when it's ready." Although this amazing vacuum cleaner is a great example of creative solutions, it is a treatment of the problem and not a cure. Roosegaarde knows this better than anybody. 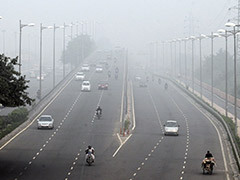 His idea gets at the root of the symptoms but not the overarching cause of smog and other urban environmental threats. Are China’s city leaders ready to start talking about the causes? Roosegaarde thinks so. "They're very interested to make smart decisions,” he said, “to think like a network, where the desires of the people and the effect those decisions have on them are more in balance." Posted on October 28th under Pollution Reduction.